Collagen is the most abundant protein in a human body. It is a critical component of almost all organs and tissues, providing the framework for cell attachment and growth. Collagen degradation regulates normal tissue remodeling which occurs during development, homeostasis and repair, whereas excessive collagen degradation is a key feature of tissues in a variety of diseases, such as cancer, inflammation, and fibrosis. All types of collagen from all species share the triple helical protein structure, which is nearly exclusively found in collagen. 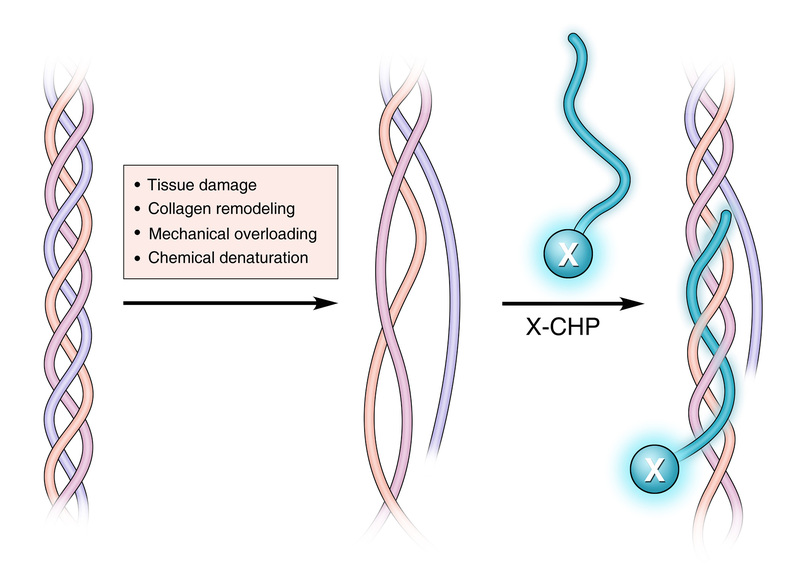 After being cleaved by a collagenase, the collagen molecule becomes thermally unstable at body temperature and the triple helix spontaneously denature. [3,4,5] It is also found that unfolding of the collagen triple helix occurs during mechanical injuries of connective tissues and is an important damage mechanism. The founders of 3Helix invented the Collagen Hybridizing Peptide (CHP) that can specifically bind to unfolded collagen molecules, by forming the triple helix with the denatured collagen chains, in a fashion analogous to a primer binding to a melted DNA strand during PCR. Conjugated with a fluorescent or biotin label, CHP is the first probe of its kind to enable direct detection of unfolded collagen molecules in virtually any tissue that has been subject to mechanical damage, or enzymatic remodeling (whether physiologically regulated, or disease associated). Collagen is also one of the most widely used natural scaffold materials for regenerative medicine. The process of harvesting native extracellular matrices by removing cells from animal tissues (i.e., tissue decellularization) may alter the collagen structure and negatively affect the mechanical property and regenerative capacity of the ECM materials. CHP enables assessment of the structural integrity of collagen matrices from the molecular level, and facilitates optimization of the decellularization protocols. Additionally, CHP can be used in several biochemical assays, such as in-gel Western blot, for identification and possibly quantification of collagen content in a biological sample. Matrix metalloproteinases and the regulation of tissue remodeling. Nature Reviews Molecular Cell Biology (2007) 8, 221-233. Collagenase unwinds triple-helical collagen prior to peptide bond hydrolysis. EMBO Journal (2004) 23, 3020-3030.